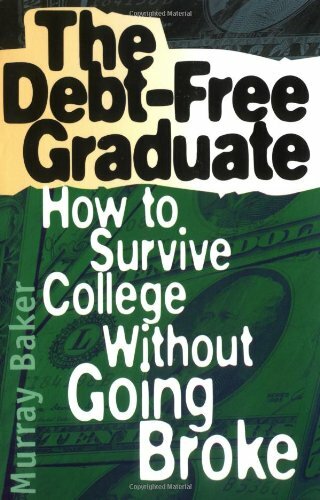 Murray Baker gives helpful advice on how to emerge debt-free from college. It’s Friday afternoon, and Aidan’s gotten his second paycheck. His first and most frequent destination with the money’s burning the proverbial hole in his pocket: the bank. There, he will cash the check and take out $160 to spend during the next couple weeks, largely on different varieties of fast food. To his credit, he is planning to save $100 per check. In so doing, he is acting on one of the many recommendations Murray Baker supplies in The Debt-Free Graduate. Written primarily for folks in Aidan’s age bracket, the book tackles all manner of subject in a style that’s alternately straightforward, practical, witty and even a tad snarky. Published in the late 90s, the book does feel a bit dated in places-it calls cell phones “wireless,” for instance-but much of the content is timeless. It talks the reader through the in and outs of federal loans, of applying for all types of scholarships, and, perhaps more useful, how to be frugal while attending college and preparing to emerge. The Debt-Free graduate covers everything from how to buy textbooks to furniture, and offers tips about buying, then storing, food. Living with an ace saver like Dunreith, I found much of the material familiar, and Aidan may, too. Still, it’s never a bad idea to think about the actions we can take now so that he doesn’t emerge from college with a mountain of debt.